The Park Royal bodied railcars, numbers 1 to 4. The story of the Great Western railcar began with its inventor, C. F. Cleaver of Hardy Railmotors Limited. Hardy's were a subsidiary of the Associated Equipment Co. Ltd. (AEC), and they had provided petrol and diesel engined shunting locomotives in addition to four- and six-wheel drive lorries and tractors through their associated company, the Four Wheel Drive Lorry Company. Cleaver was a man of considerable zeal and realised that the established and successful 130 bhp 6-cylinder AEC diesel engine that was used in London buses and numerous other commercial vehicles, was capable of powering a lightweight self-contained railcar, especially if it utilised streamlining that was popular at the time. The body of the first prototype was broadly based on the popular 'Flying Hambuger' diesel unit of Duetsche Reichsbahn, but after windtunnel tests were carried out at the Chiswick laboratory of the London Passenger Transport Board, the body was transformed into a sleek streamlined design with a waisted fontal area. Using the 8.85 litre diesel engine, drive was passed to a 5-speed pre-selective gearbox with a fluid flywheel to drive to a pair of axleboxes on one side of the railcar. 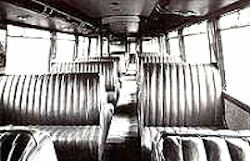 The 69 seater body was built by Park Royal Coachworks of Willesden, another AEC subsidiary, and measured 62 feet in length and 9 feet in width. 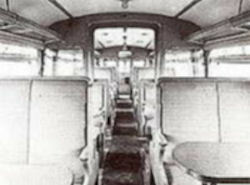 Maximum speed was 63 mph with control shared between the ends of the railcar. Before completion, the railcar was bought by the Great Western but prior to entering service, it was displayed at the International Commercial Motor Transport Exhibition at Olympia in November 1933. Such was the railcar's popularity at the exhibition, it was estimated that 35,000 people or 53.25 per cent of those that paid for admission to Olympia, visited the railcar. Great publicity, something that the Great Western thrived on, was also given to the railcars movement from Olympia to the GWR sidings at Brentford when the exhibition closed. Its first official run on Great Western metals was from Paddington to Reading with a large number of press representatives on the 1st of December 1933, and even AEC jumped on the publicity bandwagon by proclaiming the run as 'an unqualified triumph', and entered public service on the 4th of December working from Slough shed to Windsor and Didcot. Within the month however, the railcar was taken out of service for attention to its braking system and method of engine mounting. At the same time, automatic train control was fitted and the car resumed service in February 1934, completing 60,000 miles and transporting 136,000 passengers in its first year alone. Specifications of GWR Railcar No. 1. The success of railcar number 1 prompted the Great Western to place an order with AEC for a small series of six railcars in February 1934, the same month that number 1 entered regular service. A number of improvements in the design was made on this series, the largest of which was the instalment of two AEC 8.85 litre diesel engines raising the maximum speed to 80 mph. The first three units, numbers 2 to 4, were to be fitted with a buffet bar for use as an express businessman's service between Birmingham and Cardiff, but no decision could be made on the body of the last three and so construction of these bodies was held over for the time being. 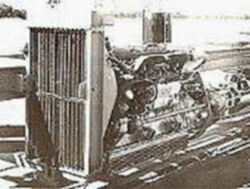 The underframes and power units were again built at AEC under the direction of C. F. Cleaver with the bodies built by Park Royal. To assist with oil temperature control, the sumps of the engines were enlarged and fitted with cooling fins. Unusually, the bogie's were both gear-driven and directly-driven in that only one gearbox was fitted that powered both bogies at one end of the railcar, while the other engine directly-drove just one bogie at the other end. The fluid flywheel provided on this engine was designed to slip until full throttle was required in top gear. 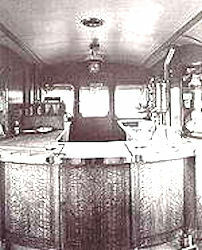 The interior design of these three railcars moved away from the bus inspired design of number 1, especially with the inclusion of a buffet and removable tables. The buffet could provide hot and cold drinks and wines and a small amount of hot foods and snacks. A gas-heated boiler fed the coffee and milk boiler and toaster, while nearby was a small toilet with hot water heated by the engines exhausts. The first of the series was delivered in early July 1934 and underwent several trail and press runs before entering service with the other two members on the 16th of July. This service was the first regular diesel working to be run to a fast schedule in this country and the 117� miles between Birmingham and Cardiff were covered in 2 hours 20 minutes. Fares were charged at the normal 3rd class pricing but bookings were limited by the number of seats on the railcar. Specifications of GWR Railcar Nos. 2 to 4.